For my German A-level oral exam you had to research and write a piece on a topic of your choice to discuss. There were only two of us in the class, and my counterpart had the good sense to write about skiing. I was particularly interested in WWII history at the time so I decided to write about the Hitler Youth movement, even though it was a pain to research as the school internet filter had a blackout ban on the word 'Nazi'... Anyway, here's the English translation of that report, followed by my school level German. The history of the Hitler Youth begins in Munich in 1919, with the founding of the German Workers' Party. Adolf Hitler had to investigate the party for the authorities, but the ideology so well suited him that in this same year he became a DAP member. By the summer of 1921 Hitler was the leader of the party, now known as the National Socialist German Worker's Party or 'NSDAP' [i.e. Nazi]. But the party was only for adults. This changed in 1922. An 18-year-old named Adolf Lenk wanted to join the NSDAP. But he was too young - members had to be at least 21 years old. Naturally he was disappointed and told Hitler that their ought to be a Nazi youth organisation. Hitler was of the same opinion and the result was the 'Jugendbund' [Youth Federation]. By the end of 1922 it had 250 members; but it was short lived. Following the unsuccessful Putsch by the NSDAP in November 1923 [i.e. the Munich Putsch], the party and its youth organisation were made illegal. Hitler meeting with Hitler Youth units. Although there were a couple of groups given different names in an attempt to evade the police (e.g. 'Wandersportverein-Vogtland' [Hiking Club] and 'Deutschvölkischer Jugendbund Yorck von Warternburg'), we don't see another official Nazi youth organisation until 1924. 1928 witnessed the beginning of the girls' organisation 'Schwesterschaften' [roughly 'sisterhood'] (which would later become the 'BDM'), and in 1933 Hitler became the German Führer [leader]. 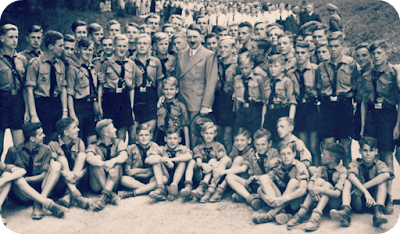 Other youth organisations were quickly forbidden, in fact membership of the Hitler Youth became obligatory in 1936. Between 1933 and 1939 many children had already joined because of the violence towards other children by the Hitler Youth, and threats from Nazi supporters. At the beginning of the 2nd World War the Hitler Youth had more than 8 million members. There were two groups within the Hitler Youth for boys. First came the 'Jungvolk' [Young Boys' League] for 10 to 14 year olds, and the Hitler Youth proper for 14 to 18 year olds - although younger boys doubtless took part. 150 boys made a 'Fähnlein' [company] but the smallest unit was the 'Kameradschaft' [literally 'comradeship']. 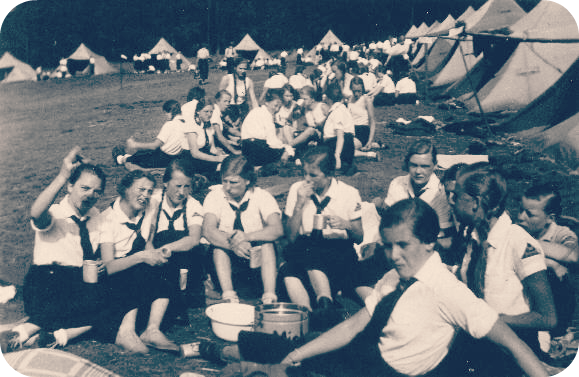 There were also two groups for girls; the 'Jungmädel' [Young Girls' League] for 10 to 14 year olds, and then the BDM for 14 to 18 year olds. 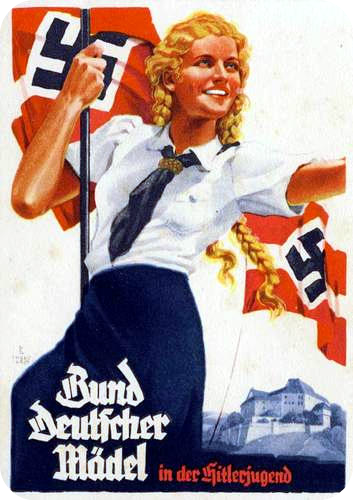 The BDM was an abbreviation of 'Bund Deutscher Mädel' [League of German Girls] although an alternative version was 'Bald Deutsche Mutter' [Soon to be German Mothers]! Many members of the BDM treated Hitler like a modern group of girls might a pop star; his visits to BDM groups were generally accompanied with screaming, swooning and fainting. From 1938 young women aged 17 to 21 years old could become members of the BDM-Werk, Glaube und Schönheit (Work, Faith and Beauty Society). 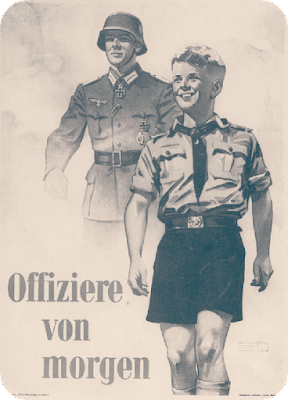 The majority of German children (especially the boys) couldn't wait to become members of the Hitler Youth. At ten years old almost every 'ethnically pure' boy took the 'Pimpfenprobe' [lads test]. With this test they had to prove themselves. It was very difficult and the required activities were normally as follows: a 60 metre sprint in 12 seconds, a long jump of 2.75 metres, and a baseball throw of 25 metres. Often the Jungvolk leaders would also make the boys do a 'Mutprove' [test of courage], for example jumping through an open window to prove their trust in the leaders. Naturally it was safe - but the boys didn't know this! After a successful test a boy would recite the words 'Meine Ehre heißt Treue' ['My Honour is called Loyalty', a phrase which was also the motto of the SS]. Now he was a true member of the Hitler Youth. 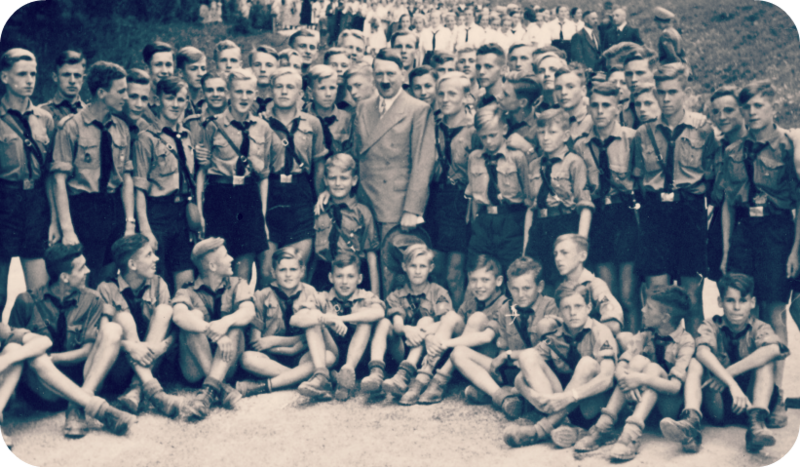 The Hitler Youth met at least twice a week. The 'Heimabende' [Home Evenings] were meetings where the Hitler Youth members had to learn the Nazi view of German history. Hitler believed that the boys needed young leaders to look up to. Because of this the Jungvolk had leaders who were only 14 or 15 years old, although it must be said that they were not very good teachers! For many Hitler Youth members these 'Heimabende' were a necessary evil because they were so boring. 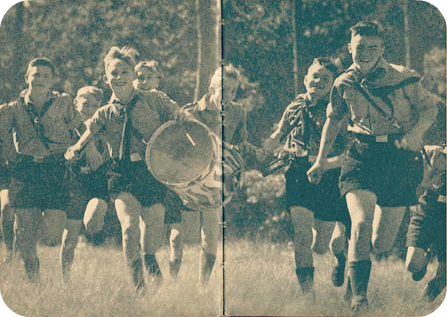 Centrespread from the 1938 Jungvolk Jahrbuch [Jungvolk Year Book] - the activities the HJ took part in were very similar to what Boy Scouts might be doing in Britain. There were also other activities. The Hitler Youth had their own duties, like patrolling the markets and the cafes. At the weekend there was sports, camping, hiking or war games. The older children learned how to use a rifle. They were being trained to become little soliders, ready to fight for their Führer. At the same time the girls learned how to be perfect mothers and wives. These children wanted to create a new Germany for their Führer. Why did the German youth follow the Hitler Youth? This is a very complicated question, and for every child the answer was somewhat different. But at a general level the answer is clear. Children always want to be accepted as part of their peer group. The uniform, the parades, and so on, all helped to create a common identity and sense of belonging within the Hitler Youth. This was the plan of the Nazi Party. As the expert Guido Knopp has said, 1945 was more than a total defeat. It was the collapse of a complete belief system.The veterans of the Hitler Youth had to learn new values. And this was, in general, successful. Even Pope Benedict XVI was once a member of the Hitler Youth. Today these people no longer believe in Nazi ideology, although some of their grandchildren do. These 'Neo-Nazis' listen to 'Rechtsrock' [literally 'right rock', sometimes known as RAC in English speaking countries] and are strongly against Jews, Turks, asylum seekers and other foreigners. The influence of the Nazis cannot easily be forgotten. Cover of Der Pimpf, the Nazi magazine for boys which began publication in 1935. There was also one for the girls, called Das deutsche Madel. Die Geschichte der Hitlerjugend beginnt in München in 1919, als die “Deutsche Arbeiterpatei” sich gegründet wurde. Adolf Hitler muste diese Partei für die Regierung untersuchen aber die Ideologie der Partei hat ihm so gut gefällen, dass in diesem Jahr Hitler der Partei beigetreten ist. Als im Sommer 1921 Hitler der Vorsitzende der Partei war, heißt die Partei “Nationalsozialistische Deutsche Arbeiterpartei” oder “NSDAP”. Aber die Partei war noch nur für Erwachsene. Dies hat sich 1922 verändert. Ein achtzehnjähriger Nazianhänger, der Adolf Lenk hieß, wollte ein Treffen der NSDAP besuchen. Aber er war zu jung, weil man 21 Jahre alt sein musste. Natürlich war er enttäuscht und er sagte zu Hitler, dass es eine Nazi-Jugendorganisation sein sollte. Hitler war der gleichen Meinung und die Folge war der “Jugendbund”. Ende 1922 hatte es 250 Mitglieder. Leider hat es nicht lang gedauert. Nach dem unerfolgreichen Putsch der NSDAP im November 1923 ist die Partei und die Jugendorganisation illegal geworden. 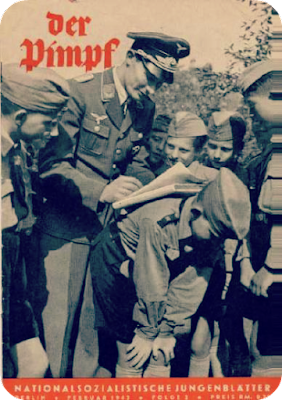 'Join us', as Germany entered total war military youth divisions were formed. Obwohl es ein paar Gruppen mit anderen Namen gab, um die Polizei zu vermeiden (zB. “Wandersportverein-Vogtland” und “Deutschvölkischer Jugendbund York von Wartenburg”), sehen wir keine offizielle Nazi Jugendorganisation mehr bis 1924. 1928 sah der Beginn der Mädchenorganisation “Schwesterschaften” (die später zum “BDM” wurde) und 1933 ist Hitler Führer von Deutschland geworden. Andere Jugendorganisationen waren bald verboten, in der Tat war Mitgliedschaftin der Hitlerjugend von 1936 an obligatorisch. Zwischen 1933 – 39 traten die meisten Kinder der HJ bei, wegen der Gewalt der HJ zu andere Kinder und Drohungen von Nazibeamten. Am Anfang des 2. Weltkriegs hatte die HJ mehr als 8 Millionen Mitglieder. Es gab zwei Gruppen der Hitlerjugend für Jungen. Erstens gab es das Jungvolk für 10 bis 14 Jährige und dann die richtige Hitlerjugend für 14 bis 18 Jährige, obwohl jüngere Kinder zwanglos teilnehmen konnten. 150 Jungen machten ein “Fähnlein” aber die kleinste Einheit war die “Kameradschaft”. Es gab auch zwei Gruppen für Mädchen; Die Jungmädel für 10 bis 14 Jährige und den BDM für 14 bis 18 Jährige. Der BDM war eine Abkürzung von “Bund Deutscher Mädel” aber eine beliebte Alternativ war “Bald Deutsche Mutter”! 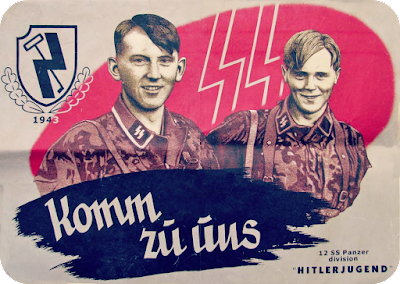 Propaganda posters for the BDM, the first reads: Youth Serves The Führer, all ten years olds to join the Hitler Youth. Membership of the HJ was compulsory from 1936, though in practice you could often avoid attending meetings until the law was tightened in 1939. Die Mehrheit der deutschen Kinder (besonders die Jungen) konnten nicht warten, Mitglied der Hitlerjugend zu werden. Mit 10 Jahren macte fast jeder “ethnische reine” Junge die “Pimpfenprobe”. Mit dieser Probe mussten sie sich beweisen. Es war schwer und die Aktivitäten waren normalerweise folgendermaßen: einen 60 Meter Sprint in 12 Sekunden, einen Weitsprung von 2,75 Meter und einen Baseballwurf von 25 Metern. Oft wollte der Jungvolkleiter auch eine Mutprobe, wie zum Beispiel durch ein Fenster springen, um das Vertrauen in den Leiter zu beweisen. Natürlich war es sicher – aber die Jungen wußten dies nicht! Nach einer erfolgreichen Probe bekamen der Junge ein Messer mit den Wörter “meine Ehre heißt Treue” darauf. Jetzt war er ein echtes Mitglied der Hitlerjugend. Die Hitlerjungen trafen sich mindestens zweimal pro Woche. Die Heimabende waren Treffen, wo die Hitlerjungen den nationalsozialistischen Blick der deutschen Geschichte lernen mussten. Hitler glaubte, dass die Jugend jungen Leiter haben muss. Also mussten Jungvolkleiter mit nur 14 oder 15 Jahren unterrichten, obwohl sie nicht sehr gut Lehrern waren! Für viele Hitlerjungen ware diese “Heimabende” ein notwendiges Uebel, weil sie so langweilig waren. Es gab auch andere Aktivitäten. Die Hitlerjungen hatten Aufgaben wie z.B. das Patrouillieren von Wirtschaften und Cafes. Am Wochenende gab es Sport, Camping, Wandern oder Kriegspiele. Die älteren Jungen lernten, eine Schußwaffe zu benutzen. Sie mussten als kleine Soldaten ausgebildet werden, um für den Führer zu kämpfen. Zur gleichen Zeit lernten die Mädchen, Mutter und Frauen zu sein. Diese Kinder wollten ein neues Deutschland für ihren Führer erschaffen. Warum ist die deutsche Jugend der Hitlerjugend gefolgt? Dies ist eine sehr komplizierte Frage und für jedes Kind war die Antwort etwas anders. Aber im Allgemeinen ist die Antwort klar. Kinder woollen immer gut mit anderen aus ihrer Altersgruppe auskommen. Die Uniform, die Paraden, usw. haben alle in der Hitlerjugend gleich gemacht. Dies war der Plan der Nazipartei. Wie der Expert Guido Knopp gesagt hat, 1945 war mehr als nur die totale Niederlage. Es war der Einsturz von einem ganzen Wertsystem. Die Veteranen der HJ musste neue Werte lernen. Und dies war erfolgreich im großen und ganzen. Sogar der neue Papst Benedict XVI war einmal Mitglied der Hitlerjugend. Heute glauben diese Leute nicht mehr an nationalsozialistische Ideologie, allerdings glauben einige ihre Enkelkinder daran. Diese “Neonazis” hören “Rechtsrock”, sind stark gegen Juden, Türken, Asylbewerber und andere Ausländer. Der Einfluss der Nazis können wir sicher nicht leicht vergessen. 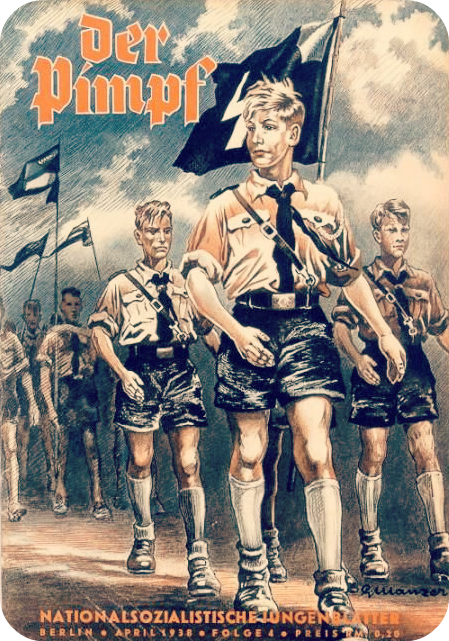 April 1983 cover of Der Pimpf. Back to the essay masterlist.